Moving home when you have small children may be stressful for you, but it can also affect them. Here’s some tips to make moving a positive experience for your children. Explain to your children that you’re moving and show them any photographs you might have of the house. If they have their own rooms you could talk to them about how their bedrooms will look. If you need to buy new curtains show them what you have in mind and let them pick the set they like best. It’s a good idea to find out about self-storage options when you’re moving to a new house in case anything goes wrong along the chain. You might find you have to move out of your home, but you can’t move into your new one. Self-storage is an ideal solution if this problem occurs. This will mean you won’t get too stressed which your children might pick up on. If your children are going to be changing schools, see if you can arrange a visit beforehand. That way they know where they will be going and how they will get to school. Take a walk around the area and find out where places are that your children will be likely to visit. Pop into the library and spend some time at the local park. To make your child feel more secure about where their possessions are going give them a couple of boxes and encourage them to pack their own toys and books. Help them to seal the boxes and write their names on the labels. If you’re having some of your furniture moved into self-storage you can buy packing materials from Store-Safe. If your children are at primary school then they might be saying goodbye to friends. Throw them a small going away party so they can have fun, take photographs and create some nice memories. Pack up a bag for each of your children with their favourite toys and some snacks. If they are going to stay with family or friends for the day explain you’ll be back in time for bed. Phone them once in the day to re-assure them that everything is going well. Make up their beds and lay out their pyjamas for when they arrive. Leave their boxes open so that they can see familiar things. Give them some time to get used to the room and the new house before you put to them to bed so they feel comfortable in their new surroundings. Make time to take them out the following day even if it’s just for a short walk to the shops or to take a book out from the library. If you’re moving during the summer holidays try and find out if the school has any holiday activities. Enrol your children and that way they stand a good chance of making some friends before school begins. 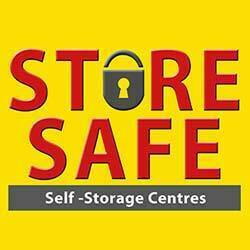 If you’d like to know more about self-storage in Stoke, contact us by filling out the form on the website or give us a call on 01782 785 370. How Safe Is Your Storage Unit?